Our Blog We finally did it! 11/15-16/2014 Summary: Well we finally did it…we left Gulfport, MS on the start of our Great Loop (GL) adventure. Tom met Brian Welch at the Gulfport, MS (GPT) airport at 6:00 AM, where he left off the rental car. We had finished the major items on the “To Do” list the day before, and so were ready to go. Actually, we had put off leaving by a day due to the weather, so we had a bit more time to get things ship-shape for the initial leg of the trip. 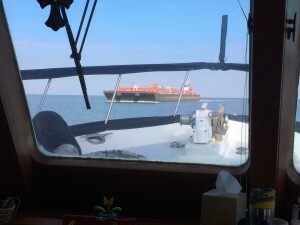 We headed out the Gulfport ship channel to meet the imaginary magenta line marking the Gulf Intracoastal Waterway (ICW, technically GIWW), took a left and headed for Mobile Bay. We were very relieved to find the autopilot was in fact working, although we could not totally figure out how to get the chart plotter to “talk” with the autopilot and go in more than a straight line. Another manual to read through…again! 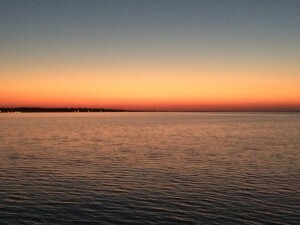 We had left early so we could make it past Mobile Bay, which can get very rough in the wrong wind conditions. The forecast looked good, but cold…and it was. 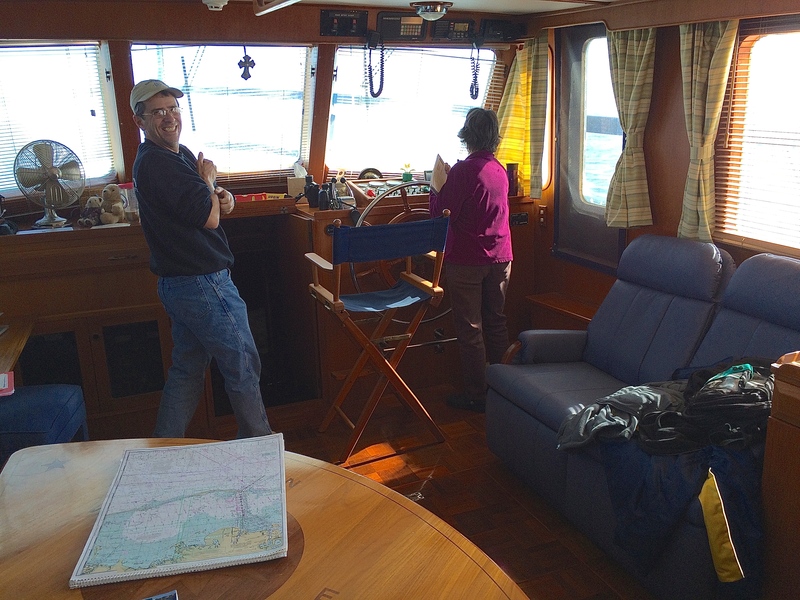 We started out driving on the flybridge, but soon the cold drove us to the lower driving station and the warmth of the main salon, where we remained the rest of the day. We motored across the bay in light chop, with just an occasional roller sending spray up over the bow to totally mess up the windows Paula had cleaned the day before. More than once she was out in the cold breeze re-cleaning the windows so we could see where we were going. We were not long on the ICW when we passed our first barge. This one seemed to be carrying some kind of fuel in the front 2 barges, with maybe gravel in the 3rd one. Overall, it was about 100 yards long, being pushed by what they call the tug, which was only about 40 feet long. It must have been all motor! This was the first of several we saw the first day, and of the hundreds we will see along the way. 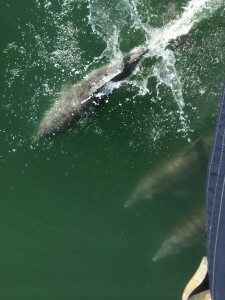 Paula’s highlight was when the dolphins would join us to ride along on the bow wave as we motored east, sometimes for just a few minutes, but at times they would hang around for a mile or so and, on occasion, even jump up totally out of the water just a few feet in front of the boat. She saw about 5 pods the first day, with as many as 5 riding along at a time. Click here to see the video of them playing. 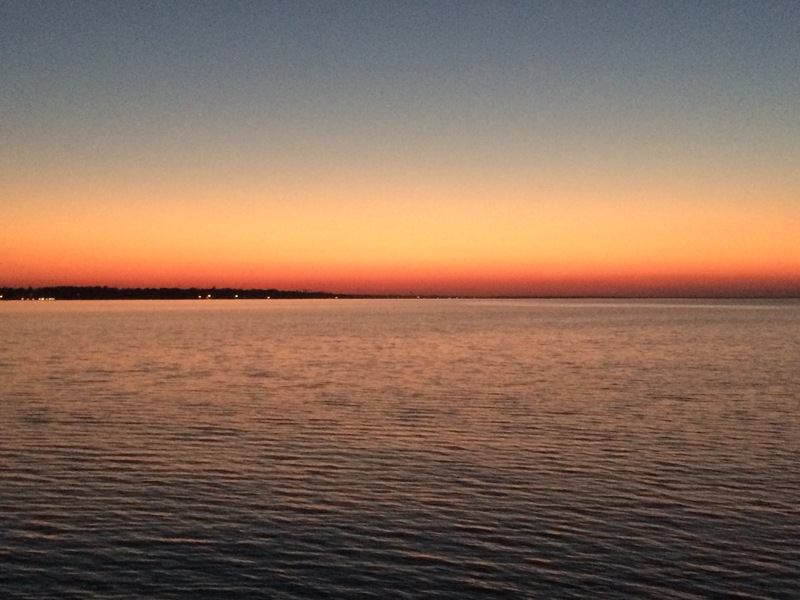 We got across the bay just as the sun started to set, so instead of making it into “the ditch,” we tucked in on Bon Secour Bay just north of a spit of land protecting us from the Gulf. We found a nice calm place there to anchor for the night. Tom grilled T-bones on the aft deck while Paula cooked up some potatoes and biscuits to celebrate the first dinner on our great adventure! Oh, did I mention homemade 3-berry ice cream for dessert? So our first day was a big travel day, driving 10 hours and making about 76 miles – way more than we plan for a “normal” day. 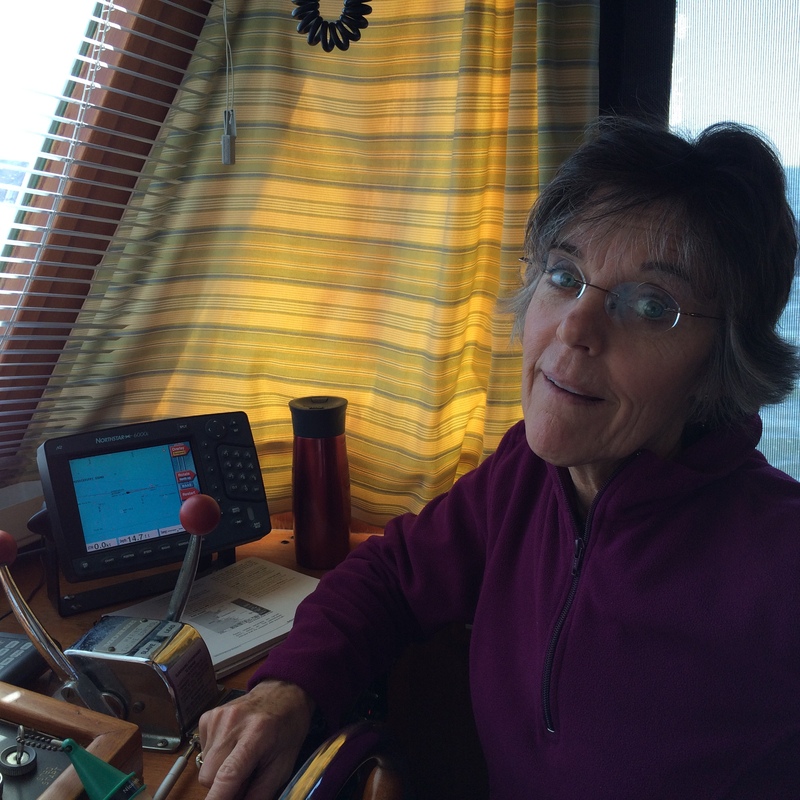 11/16/2014 – We all slept well with very little movement of the boat. Most of the time, the anchor chain went straight down from the bow. Retrieving the anchor was a project, as the chain and anchor were caked in a dark mud, which took seemingly forever to wash off. We were moving by 7:00 AM, headed back to the magenta line and soon entered “the ditch” of the ICW, a narrow channel less than 100 feet across, compared to the wide-open bay of Mobile. This will mark the spot where we will eventually “cross our wake” when we complete the GL in 2 or 3 years. 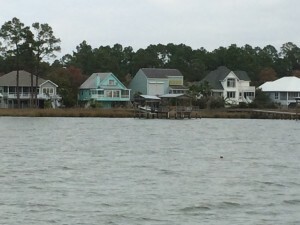 As we traveled along the narrow channel, there were houses along the banks; some had obviously been there for many years, while others were newer with huge porches and a dock on the waterway. Most of the boats were on lifts to keep them out of the water, protected from the wave action of passing boats. We passed Lulu’s, the restaurant and bar owned by Jimmy Buffet’s sister – a big place with its own marina. Since it was Sunday morning, all was quiet. We also passed more barges going west. It seemed most were fuel barges which put out an impressive amount of turbulence. There were very few pleasure boats along the way, with the exception of half-dozen fishing boats, as well as a number of folks fishing from the banks. Small marinas dotted the banks along the way as we moved out of the ditch and through several smaller bays before opening up into Perdido Bay. The water started to clear, changing from a mud bottom to a sandier bottom. And all along the way…more dolphins, even some in the ditch area, which surprised us! Why would they want to be in this little channel when they could be out in the open bay? 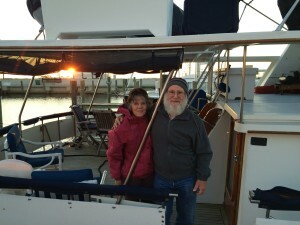 We planned to leave the boat at a marina in Pensacola while we returned to Phoenix. Brian knew of a marina right downtown, so we checked it out by phone. They wanted $700 (plus tax) for a month. Sorry, not happening! So with the help of Active Captain, we found a place for about half that just the other side of Santa Rosa Sound. Santa Rosa Marina was a small clean marina right next to the bridge connecting Santa Rosa Sound with Santa Rosa Island. Brian’s wife was already on the way from Gulfport to pick him up, and she arrived shortly after we got the boat secured and washed down. 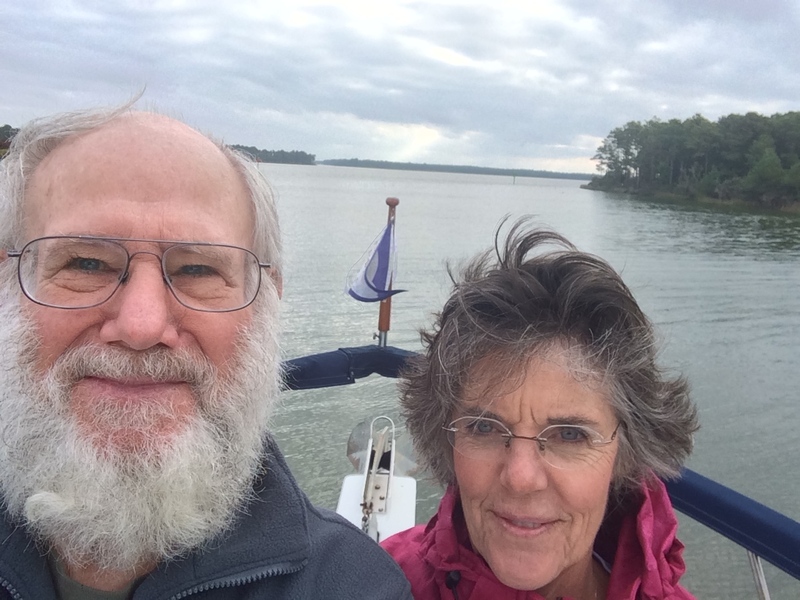 After a short visit, they headed for home, while Paula rounded up all the leftovers for our last dinner on LT on our first leg of our adventure. 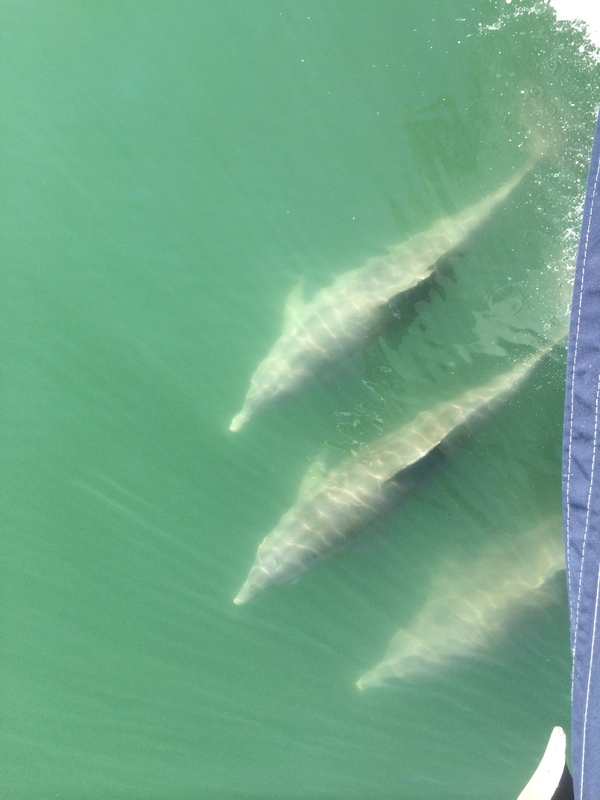 On day 2, we made about 40 miles and saw lots more dolphins. (Paula watched a pod of 5 which stayed with us for about 20 minutes!) 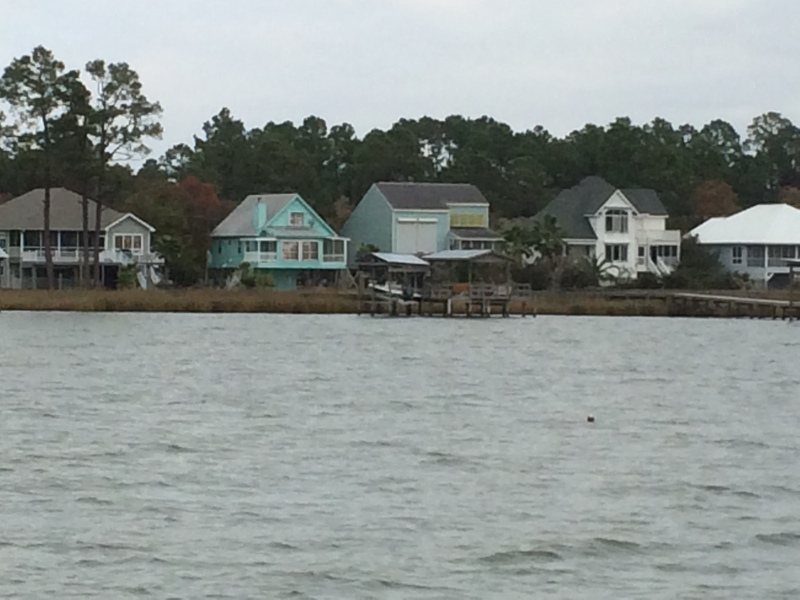 We also saw some beautiful areas along the waterway, including some big marinas with lots of big boats. This was a 7-hours-on-the-water day, much more to our liking, but still a bit long. So we headed home for a while, looking forward to our return and the next leg of our great adventure. I’m so excited for you guys! And so the dream becomes reality. Phil and I are in Hawaii. Hope to see you in the desert soon! Congratulations! The adventure begins!… may it be as enjoyable and blessed as your life’s journey has been so far. And… no traVails!. Thanks so much for the suggestion of a sight to see and place to eat. I hope more people will make suggestions about areas they know! Don’t want to miss anything! Sweet! You be havin fun now! Thanks for sharing your adventure with us! It’s so fun to see your dream become reality. Bon Voyage and many blessings on your Travails! It is very exciting to see you guys fulfilling a dream. We will be faithful followers of this adventure. Kathleen would really like the ice cream recipe. Yum! Our prayers are with you and always looking forward to the day we can hear your adventures in person! We love you!